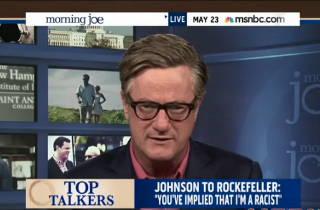 During Friday’s cup of Morning Joe, host Joe Scarborough took issue with Democratic Sen. Jay Rockefeller‘s claim that some opposition to the Affordable Care Act is driven by hatred of President Obama‘s race. I have been behind closed doors with thousands of conservatives through the years. I have never once heard one of them say in the deep south, or in the northeast, or in South Boston: ‘Boy, I really hate Obamacare because that black president.’ No, I’ve never heard anybody come close to saying that. And I have spoken to some wildly right-wing groups; I have never heard it once. The host also suggested Rockefeller apologize to Johnson and his Republican colleagues. Washington Post columnist Eugene Robinson noted that Rockefeller said “some” of the opposition was racist; not all of it. He suggested doubters look at his own hate mail to see that there is sometimes a racial element to the opposition.